A new financial award in Athletics and Recreation – known as the Jean Béliveau Award – will recognize and support top McGill student-athletes as well as honour the memory of the legendary Montreal Canadiens captain and inspirational community leader. Several important McGill donors (George Lengvari and Terry Tretiak of Lengvari Capital, The Rossy Family Foundation, the Joe Weider Foundation, Power Corporation and the Martlet Foundation) were instrumental in establishing the endowment, which is expected to generate approximately $25,000 a year. Those funds will be used for awards for up to four full-time varsity student-athletes (two men and two women) who have demonstrated academic achievement and leadership in student and/or community affairs. The inaugural winners of the Jean Béliveau Awards are two Education students, Mélodie Daoust and Joel Houle. Daoust, a Canadian Olympian and captain of the McGill women’s hockey team, combines on-ice excellence with off-ice leadership as a community ambassador for McGill Athletics and Recreation, as well as being involved with numerous youth sports camps and clinics. 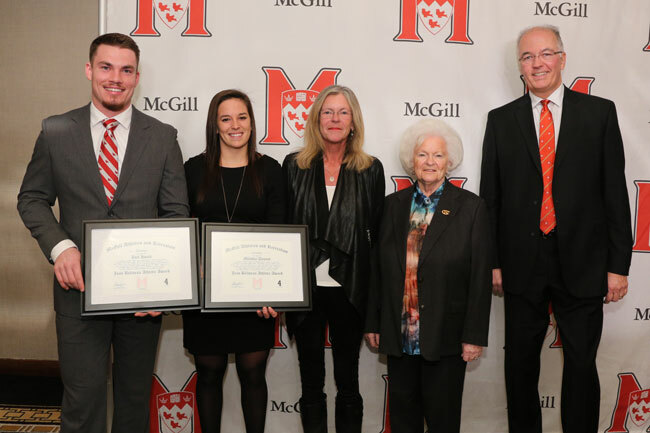 Houle, a tight end and co-captain with the McGill football team, complements his gridiron achievements with volunteer work at several Montreal hospitals. Béliveau skated for 18 seasons with the Canadiens from 1953-1971; he was a member of 10 Stanley Cup-winning teams as a player and seven more as an executive with the team. Off the ice, Béliveau supported charities in Quebec and throughout Canada. In 2003, the Montreal Canadiens introduced the Jean Béliveau Trophy, which is awarded to the Canadiens player who best demonstrates community involvement and spirit. “Le Gros Bill” died Dec. 2, 2014, in Longueuil. Olympic Team member and Captain Of the McGill Hockey team, congratulations! Co-Caption of the Football team congratulations. What an honour to receive such an award! Your name besides Jean Béliveau is quite an accomplishment in itself. Many efforts, pain, sweat and time goes in managing school and sports. Add volunteering to it and you get a great embassador for any organization to be proud of. Good job McGill in your selection! Joel comes from a good family and deserve such recognition and encouragement.